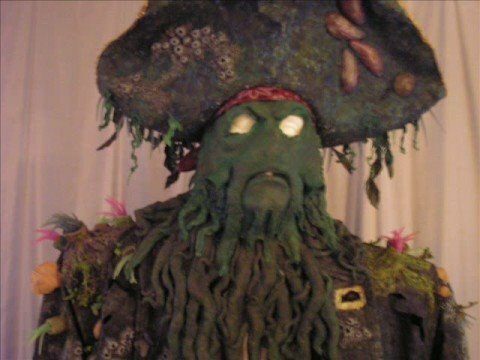 Making a Davy Jones Costume Won’t Take You To His Locker « Adafruit Industries – Makers, hackers, artists, designers and engineers! A latex mask (made with the same method seen here) added onto clothes torn and aged, with lots of seashells hot glued onto them. Scrap pieces of cloth and clay added more details. Claw arm and peg leg made out of foam boards, oatmeal containers, and plaster strips. Hat made of a cheap foamy hat expanded with a yellow trim. Pipe made out of clay, sword made out of a yardstick.